A Palm City mother said her son with special needs was left with large scratches and bruises and after a teacher's aide restrained him. The Martin County School District told WPTV it was just following policy. Ashley Hoffman said her 13-year-old son Anthony is scared to go back to school. Hoffman said in October a district behavioral specialist held her son’s arms behind his back and pushed on his chest, leaving him with bruises. The district said Anthony posed a danger to himself and others. "It hurt a lot, don’t know how to explain it," said Anthony McBride. "I was kind of breathing heavy. My chest hurt like how it would feel to get it pushed on hard. Felt like 15 or 10 minutes." The 8th grader at Hidden Oaks Middle School in Palm City said it all started over a pencil. Anthony said after he went to his cubby to get one out of his backpack, the behavioral specialist took it away. "I was trying to ask why he took my backpack and no one would say anything," said Anthony. Anthony said he was then told by the teacher to grab a pencil from her desk. He was upset so he dumped the pencils on the floor. He said he was told to pick them up. "Whenever Anthony bent down to go pick up the pencils, that’s when the aide grabbed his arm. Whenever Anthony felt him grab his arm, he tried to pull away. That’s when they put him into that hold," says Ashley Hoffman, Anthony's mother. She said Anthony has ADHD, ODD, behavioral and emotional issues. "I was trying to bite him to get him off. Said you aren’t supposed to do that because I was scared. Didn’t know what to do," said Anthony. 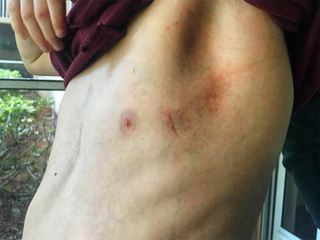 Ashley shared pictures with Contact 5, showing bruises on Anthony's chest, a large scratch on Anthony’s side, and bruises on his back. A restraint report by the Martin County School District said Anthony “engaged in physical aggression of high intensity." The report said he was throwing pencils and attempting to stab. "On the thing, it said I was trying to throw pencils across the room and stab people. I wasn’t trying to stab people at all," said Anthony. The district said state law allows trained district personnel to restrain in the event a student possesses imminent danger to self or others. Ashley Hoffman wants laws regarding restraint and seclusion out of schools permanently. "I will do whatever it takes to make sure my son is comfortable and can trust adults," said Hoffman. "Don’t put your hands on any of these children. You don’t need to put your hands on any child." The Martin County School District told WPTV on Wednesday afternoon that the behavioral aide resigned in November. The district currently has an active investigation into the incident, as does the Department of Children and Families. The Martin County Sheriff’s Office is also looking into the incident after Hoffman filed a report on Monday. She said she went to MCSO because the school district stopped talking to her the day after the incident.